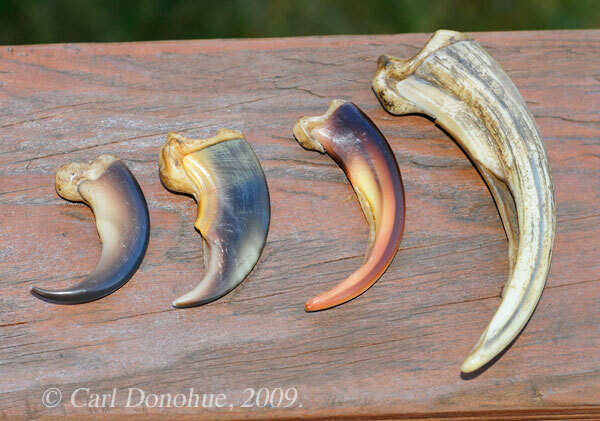 Comparison of Bear claws – black bear claws (Ursus americanus), polar bear claw (Ursus maritimus), grizzly bear claw (Ursus arctos) and Kodiak bear claws. Please click on the image for a larger version of this photo. I thought I’d post this shot, as it might be of interest to some folks. A photo showing the different size and shapes of claws from various species of American bears. From left to right, the claws are: black bear, polar bear, grizzly bear, coastal brown bear or Kodiak bear.The polar bear is the only true carnivore out of those species, but it’s claws are but a fraction of the size of those belonging to the great grizzly, and in particular, the coastal brown bear. Bear claws, and particularly the grizzly claws, were long revered as a symbol of power, both physical and spiritual, to many Native American Indian cultures; wearing the bear claw was often only an earned respect. Anyone’s who’s seen such fearsome weaponry up close can attest as to why. The relationship of the polar bear and the grizzly bear is interesting. Polar bears are believed to have split off from the grizzly bear lineage approximately 150 000 years ago in a time of global climate cooling – arctic living skills became an advantage. So the polar bears stayed in the north, and the grizzlies enjoyed the warmer climes further south. Rarely did the 2 run into each other. Now, it seems that global warming is bringing the 2 species into some conflict. Until 1996, for example, grizzlies had never been seen in Wapusk National Park area in Manitoba, Canada. Between 1996 and 2008 there were 9 grizzly bear sightings, and 3 more observed just last summer (source). Though the grizzlies of the arctic are generally much smaller than their polar cousins, they tend to be more aggressive, and will readily drive all but the largest male polar bears off a food source. They also are a potential threat to polar bear cubs. So along with an ever-harder to find food source, polar bears may now be encumbered with a new threat – their old cousins, the big clawed grizzlies. The poor old black bear sits at the bottom of the American bear tree. His hooked claws, at left, are good for climbing, and tearing open nylon stuff sacks, but he lacks the power to defend himself for his larger adversaries. The black bear’s strength apparently lies in his ability to break into automobiles in National Park parking lots and raid coolers. They’ve also been known to abscond from a backcountry campsite with a certain backpacking guide’s Teva sandal, but that’s another story. Here’s a photo of a polar bear. Interested in seeing polar bears? Take a look at my Polar Bears of Alaska Photo tour. This entry was posted in Grizzly Bears, Musings, Wildlife and tagged Wildlife on March 4, 2010 by Carl D.
Carl, very interesting comparison of the claws of the American bears. I knew the order as to size of the claws but I’d never seen them compared, as in your photo. If I might suggest, it would be nice to have a standard ruler in the photo and I assume these were all from fully grown bears. That Kodiak bear claw is amazingly scary! Thanks for reading and commenting, I appreciate it. Quite interesting Carl. I didn’t know that grizzly claws were so different than the coastal browns. I was thinking their species differed primarily in habitat occupation, not actually physical characteristics as dramatic as this. Do you know if this is typical? Interesting how the polar bear has almost a serrated edge for cutting flesh. Quite interesting also from your source article that we may soon be seeing hybrid polar/grizzlies! This is a really fascinating comparison — both in the overall size differences and in the shape and ideal function of each. Kodiaks are indeed scary. Hope the Alaskans don’t head south with climate change. Would be nice to see photos of bear tracks.